Meet Heather's Dad - Mr. Alan Ward! Alan brings a special warmth and a comforting, easy going personality to your wedding day! Having conducted hundreds of wedding ceremonies (both at the Golden Horseshoe Inn, and also previous to that as a Ship's Captain who married couples at Sea!) he will seamlessly guide you through your wedding ceremony. One of my favorite questions to answer, is when guests ask me how long the Officiant has known the couple, thinking that perhaps they go back many years...Alan has a knack for making your wedding ceremony meaningful and personal! He believes, as I do, that we are here to honor each couple and their personal beliefs, so each ceremony is tailored to reflect each individual couple! Religious, Secular and Inter faith ceremonies are all welcome, as are prayers, readings, poems, hand fastings, candle lightings and any other special tradition that has meaning to you! Born in Wales during the height of bombing in the Second World War, Alan spent his early years living in the coal mining areas of the Brecon Beacon Mountains. When he was 7 ½ Alan’s parents made the decision that opportunities for their family were much better in America than in the bombed out ruins of Welsh villages. They left Britain aboard the converted Troop ship “Georgic” and arrived at the Port of New York as immigrants in June of 1951. The family initially settled in Southern Ontario and Alan was educated in Canada, receiving his Bachelor and Master’s degrees from McMaster University in Hamilton. After a brief period of working for the Ontario Government as an Executive Assistant to the Secretary of Housing Alan started his own consulting firm. As owner and President of the Planistics Group, a firm of architects, engineers and town planners Alan traveled throughout the world working on major housing, recreational developments and relief work after major earthquakes in Central and South America. After selling his interest in the Consulting firm Alan sailed throughout the Caribbean for two years on his fifty four foot ketch “Wanderer”. A USCG licensed Captain and designated as a Justice of the Peace by the State of Florida Alan has conducted many marriages both at sea and on land! In the early 1980’s Alan returned from the sea to make his home in the mountains. Initially in North Carolina and subsequently in central Virginia he established the business now known as Blue Ridge Pottery. This business eventually grew to include many family members and enlarged to include an accommodation business in the beautiful Lydia Valley next to Shenandoah National Park and the Blue Ridge Mountains. With his varied and interesting background Alan loves meeting new people and delights in his role as a Marriage Celebrant. Alan has been appointed by the State Circuit Court in Greene County, Virginia, to conduct marriages throughout the State. With his experience in amateur theatre throughout his life Alan has an easy presence in front of an audience and thoroughly enjoys the reading of poems or scripture in the ceremonies he helps customize for couples celebrating their marriage.Alan looks forward to meeting every couple he joins together in matrimony and to making their ceremony a truly special moment in their lives! We know the quaint charm of the Golden Horseshoe Inn will help you find a unique and personal way of expressing your love for one another in both your wedding details and your ceremony! We are also delighted to share our little piece of heaven here in the beautiful Blue Ridge Mountains of Virginia - We don't think there's a prettier spot on earth! 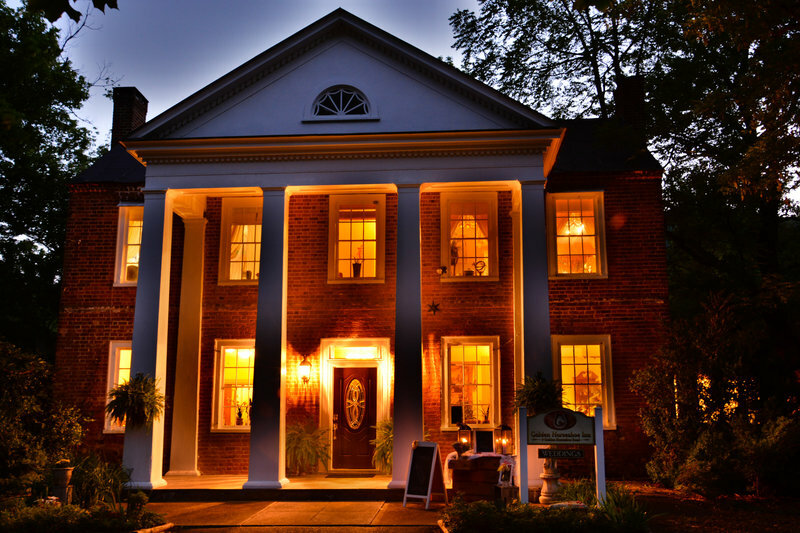 We look forward to your own love story becoming a part of the rich history of the Golden Horseshoe Inn! This incredible building is like a part of our family. Alan purchased it 31 years ago and it became the home of Blue Ridge Pottery where he and his wife and many pottery apprentices, created heirloom pieces of hand thrown pottery for guests from all over the country. Following Alan's "retirement" (this is a family joke, as Alan will never really retire lol - he has simply moved his pottery to a studio next door, where his work is for sale "on the honor system"!) The Golden Horseshoe Inn's newest incarnation, is as the home of daughter Heather's wedding business. Originally built in 1827 as a Stagecoach Inn, this building has stood the test of time. We may be a little biased, but we think a building that has stood the test of time, is the prefect place to begin a marriage that will stand the test of time!